Videos of the 25 suffolk lots have been posted to youtube. 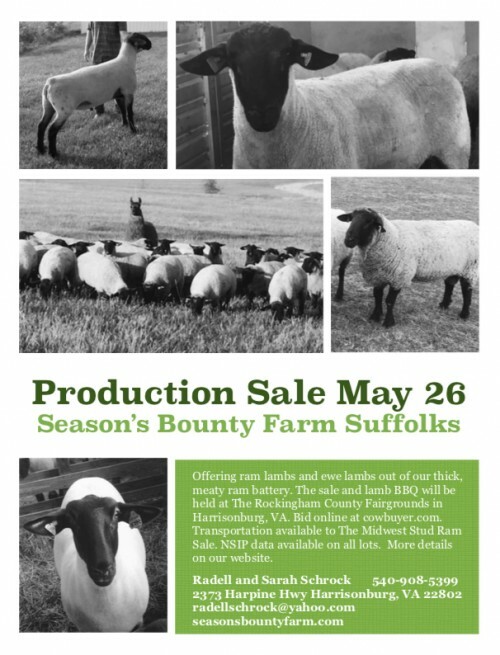 Go to youtube and simply search for "Season's Bounty Farm Suffolks" and they should all come up. 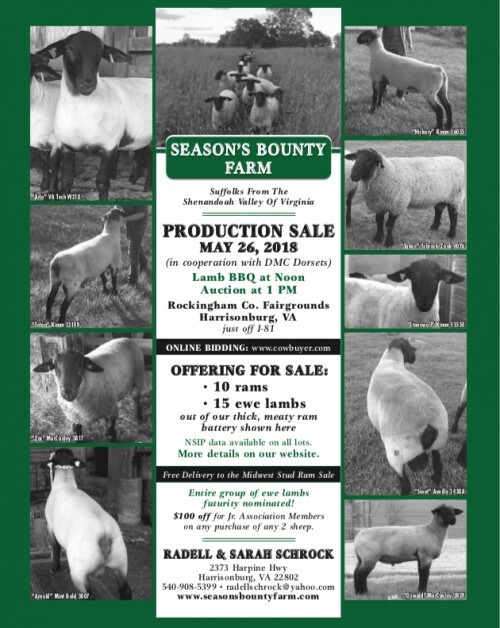 Free delivery to The Midwest Stud Ram Sale for anyone buying from a distance that could connect through Sedalia. 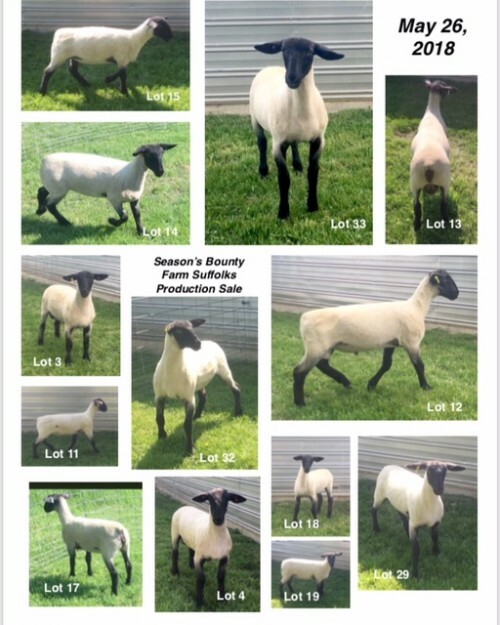 We will pick 10 rams from this list to put in the sale. 7001 (Lumberjack x Kimm 7012 daughter) - our pick of the Lumberjack sons to raise out as a yearling. Lumberjack was a ram we used for the 2017 lamb crop that we owned in partnership with Joe Emenheiser of Vermont and then sold into Montana. Lumberjack was the high indexing ram at the 2015 PA Ram Test with an ADG of 1.33 lbs for the 77-day period. 7074 (Hickory x Hammer daughter) - our pick of the Hickory sons from the 2017 lamb crop to raise out as a yearling. His dam is a "Hammer" daughter and out of the same ewe as "Slick Slack". He is particularly long and level like his mother and exceptionally correct on his feet and legs. 8038 - (Arnold x VA Tech N221 daughter) - a ram lamb bred for muscle, with both his father and maternal grandfather ranking toward the top of the NSIP charts for muscle. We consigned his twin brother to the VA Ram Test. 8064 - (Stonewall x Teton Daughter) - a particularly girth, big-boned, fast-growing son of Stonewall. His mother is long, a great milker, and has a beautiful suffolk head. 8064 has strong longevity in his pedigree with his paternal grandmother being the 14-year old Kimm 4081 ewe. And on his mother's side we still have a great, great, grandmother in our flock that is a Meadows ewe. 8070 - (Arnold x Cool Deal daughter) - one of the longest lambs in the barn, but bred for muscling, he stands wide and I expect he will end up quite large. One that really stands out in the group. Cool Deal was a ram used by Auvilles that was a son of the Hindman ram used by McLaughlin Griffin in CO.
8094 - (Arnold x Cool Deal daughter) - a calm stout son of Arnold that stands wide. He is out of our "Granny" ewe, Auville 20714. She's not really that old, but already at 6 years of age, we have around 100 of her descendants in our flock since we've used a couple of her sons, "Tahoe" and "Timber", for breeding. 8105 - (Stonewall x Teton daughter) - this ram lamb has been a favorite since he was born. His mother gave us one of our best replacement ewe lambs out of Hickory last year when she was a yearling. 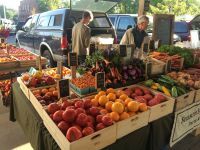 So we were eager to see what she would give us bred to Stonewall, and we weren't disappointed. He got the correct feet and legs of Stonewall and the length of Teton, all in a smooth thick package. 8120 - (Stonewall x Mighty Mo daughter) - a stout young ram with an interesting pedigree. His mother is the result of a bred ewe purchase from MacCauleys in PA. The ewe was a Kimm 7012 daughter bred to Mighty Mo, the famously stout ram that has done really well for them. 8120 is one of the youngest rams we are considering for the sale, and not as big, but we really like how stout he is. 8122 - (Oswald x Cool Deal daughter) - a triplet son of one of our high-volume ewes that has been a really good producer for us. He has a little extra size and show in his pedigree. 8165 - (Zac x Hickory daughter) - this young lamb will be barely old enough to wean by sale time, but we would like to have the heavy-duty Zac lambs represented in our sale. We really like the pedigree on this lamb. He is a grandson of our 10 year-old Meadows ewe and we intend to use both Zac and Hickory very heavily this coming breeding season, because their lambs are so robust. 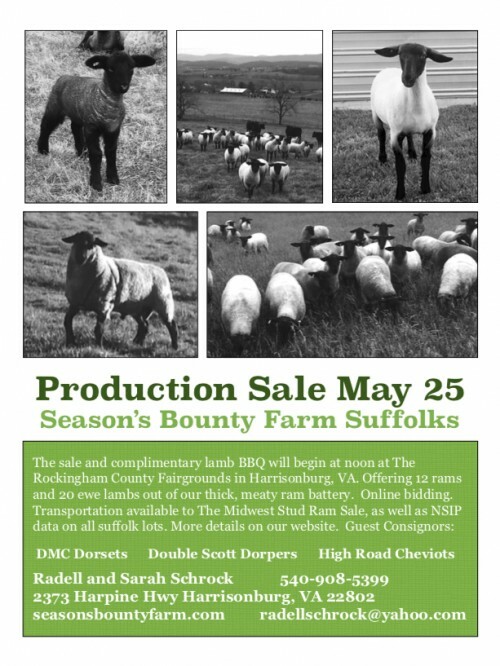 8021 - (Stonewall x Scout daughter) - a heavy-duty ram that is 3/4 purebred Suffolk. His dam is one of our best producers over the years, consistently putting out lambs that catch the eye of buyers. 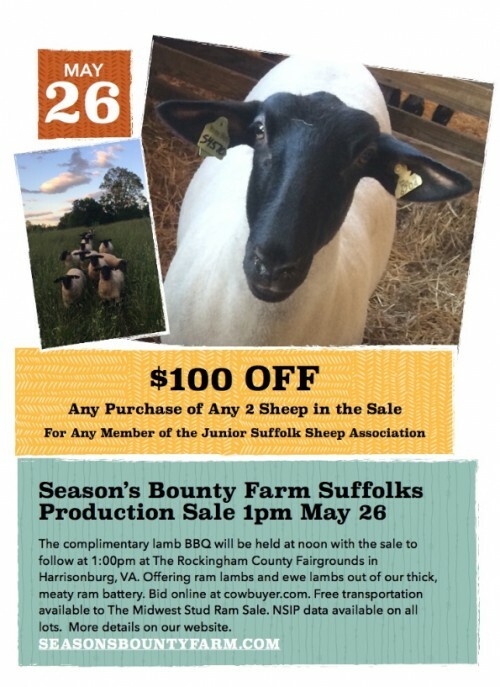 8086 - (Arnold x Scout daughter) - a long, level, growthy ram lamb that is 7/8 purebred Suffolk out of a prolific young ewe. His mother was the biggest of the 60 replacement ewe lambs we kept from the 2016 lamb crop. She had twins when she was a year old and triplets this year as a a 2-year old. We left the 2 female lambs on her and adopted 8086 onto another ewe, so he was raised as a single. He is a great, great grandson of our 10-year old Meadows ewe. 8087 - (Hickory x Doc daughter) - a growthy 3/4 purebred son of Hickory that looks a lot like his father. His maternal grandfather, "Doc" was a triplet son of the 14 year old Kimm 4081 ewe that we picked out of the 2013 Kimm sale and brought back to VA for Dr. Justin Hill. He generously let us use him for the first part of the 2014 breeding season, and we ended up with a group of thick, hardworking daughters out of him. The 15 ewe lambs in the production sale will be of similar breeding as these rams. More stats, NSIP data, photos, and videos will be posted soon.